With the recent re-opening for the Museum of Flying at the Santa Monica Airport, local site planners have been committed to the ongoing improvement and development of the building and its surrounding landscapes. Most recently, the museum installed stainless steel retractable bollards around the building’s perimeter to restrict vehicles while ensuring access for airplanes and other building operations. The Santa Monica Airport has a long history of operations—beginning during World War I when pilots began using the site as an informal landing strip. The Douglas World Cruiser, the first aircraft to complete a circumnavigation of the planet, began its journey from the airport in 1924. Most recently, to help preserve remnants of historical aviation, the Museum of Flying opened its new facility at the Santa Monica Airport—where it hosts special events and regular exhibits open to the public. The Museum of Flying opened originally in 1974 but was forced to close in 2002 for financial reasons. Beginning in 1989, the museum featured a collection of vintage, Word War II fighter aircraft. It also began hosting annual gala events honoring innovators in aviation. At its newest location, the museum offers an exhibit area of nearly 22,000 square feet and nearly two dozen aircraft from different eras, including a Wright Flyer replica, a BD-5 Microjet and a FedEx 727 cockpit. During its $4 million renovation, planners selected Reliance Foundry’s R-8400 series retractable bollards to create versatile access for restricted areas. The bollards offer clear barriers for unauthorized vehicles, while allowing foot traffic to pass freely. The bollards can also be retracted to allow airplanes to be moved freely between areas. Because of their large wingspan, several bollards needed to be retracted at the same time. Instead of removable bollards, which would require additional transportation and storage, the retractable bollards lower into the ground, significantly reducing the amount of time and labor required to operate them. The Museum of Flying chronicles the innovations that have led to increasingly safe and efficient air travel over the 20th and early 21st centuries. It seems fitting that its main building and surrounding structures should reflect that spirit of modern invention. Reliance Foundry’s retractable bollards offer sleek and streamlined aesthetics to enhance this architectural tribute to the aerospace industry. 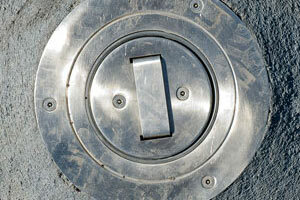 The bollards used at the museum feature simple key-locking mechanisms that allow authorized individuals to quickly lower each post into a below-ground receiver. When bollards are lowered, they close flush to prevent any danger of tripping or obstruction for pedestrians and vehicles. The Museum of Flying uses stainless steel bollards to match the modern design of their building, but the posts are also available in a range of different powder coatings for increased visibility and/or to complement the aesthetics of a building or property. Retractable bollards are used in the Museum of Flying’s daily operations, but they can be used for a range of applications. Retractable bollards are especially useful in areas where occasional access may be required for service or emergency vehicles. They can also be used for seasonal applications—or to enclose spaces for events and special activities. 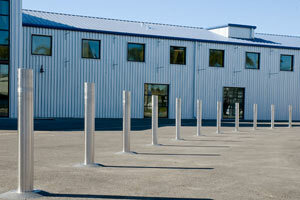 For more information on retractable bollards, contact Reliance Foundry’s Sales Department.